Highway Graphics LLC is a premier marking and striping company from the state of Louisiana with over 20 years industry experience. HGI started business in the 80's and soon expanded it's business operations into the other DOTD districts in the state of Louisiana. Many opportunities await those individuals who want to be part of an ever growing company. Is it you? On Every Job - Everytime! Highway Graphics has always believed our highly qualified staff to be our most valuable asset. In todays competitive market, they make the difference to the bottom line. Combine our people with the most modern paint and thermoplastic equipment available on the market today, and you have consistent quality striping on every job at a competitive price. "Quality People equals Quality Striping". Highway Graphics LLC has rapidly became one of the premier highway striping companies in the state by focusing on quality products and production capabilities. The company has grown to over 60 employees and 2 office locations while working in the Southern Market; completing major government and private sector contracts in Louisiana, Texas, Arkansas, Mississippi, Alabama and Florida. 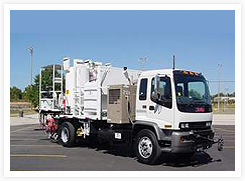 HGI is a full service marking and striping company offering all the utility services to meet your needs. Whether it is a small parking lot or a major highway striping contract, HGI is ready to get the job done.